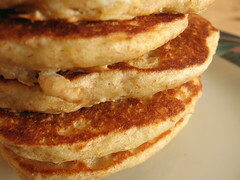 Multigrain Pancakes - Do You Know The Muffin Man? Notes: My second attempt at this recipe, after a disappointing trial a few months ago using Bob's Red Mill muesli. Actually, I had intended to make this using Kashi GOLEAN Cereal but the food processor turned it into a powder with some hard nuggets leftover. Instead, I bought Good For You muesli (the one without any sugar or fruit and nuts). The key is to make sure the cereal is ground finely so it will absorb the milk. Wow, these pancakes were as fluffy as ones I make using buttermilk (this recipe uses soured milk) and cooked up to a hearty thickness. Don't put too much batter in the pan. A candidate for replacing my default recipe!